These white pumps have been on nonstop rotation (more so than my Nicholas Kirkwood version) – they’re my pick for spring/summer. Now 40% off and selling out fast! here. The white version of my camel trench is 40% off here. It’s a great lightweight version for summer. A lover of trench coats through and through, I found some great ones that are on sale. I don’t have one in this color and absolutely love it. I already bought this one and can’t wait to wear it! This one and this one are classics and this one and this one are my splurge-worthy picks. I really like the uniqueness of this blouse – it’s a nice and elegant change to the typical white blouse for work. Happy Thursday and thanks for stopping by! So cute all the dotted picks! I have a pretty skinny body, should I wear those outfits? 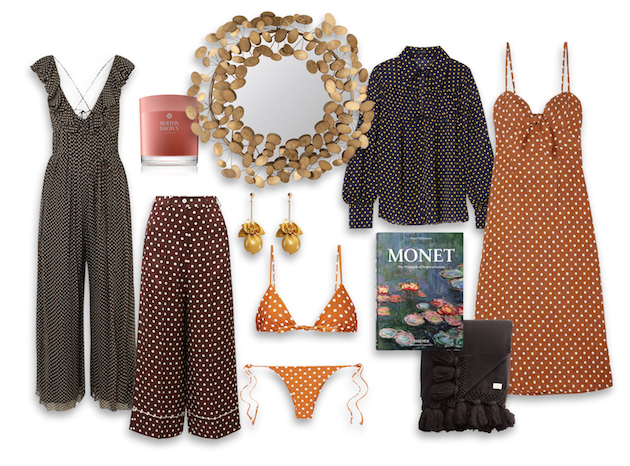 Super into polka dots lately! <3 🙂 Loving that jumpsuit so much! I’m obsessed with polka dots so I love this selection so much!